The people in Vasya's village believe she is a witch. As her neighbors become increasingly antagonistic, she is told to join a convent or get married. But Vasya chooses instead to leave everything she has known behind. Disguising herself as a boy, she rides off into the Russian countryside. She soon finds a battle to fight when she learns that bandits are terrorizing small towns. Her bravery earns her the admiration of the Grand Prince. She must continue her facade to keep the prince's trust, but her choices could put her brother, her sister, and the entire city of Moscow in peril. I absolutely adored The Bear and the Nightingale, the first book in this trilogy. Sequels can be tricky, but The Girl in the Tower lives up to its predecessor. This story gives our beloved protagonist room to grow while also giving us insight into her brother Sasha and sister Olga. If the first book was primarily about Vasya, this one is about the whole family. It also moves the story from the quiet dangers of the forest to the perils of the city and court, where the person sitting next to you could be your friend or scheming to take your place. 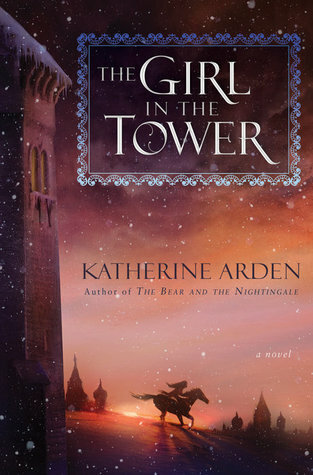 Katherine Arden does a wonderful job of holding things in tension: Vasya glories in the opportunity and danger of the woods while appreciating the safety of a city, she can't resist spending time with the frost demon Morozko but won't give up her own agency, and she is a woman who makes unconventional choices, but those decisions have very realistic repercussions for a woman of the past. It's darker and the consequences are bigger, but the enchanting writing will still draw you in and refuse to let go. The Winternight books are a beautiful blend of historical fiction and fantasy. If you haven't read them yet, you must pick them up and enjoy all of the magic that a good story with wonderful characters can provide. Glad this sequel didn't disappoint. I have this and the one that came before it and I really need to read them! Now! I am a big fan of Bear and Nightingale and looking forward to read this too! It's Monday and I have a 10-year-old! I'm back to It's Monday!